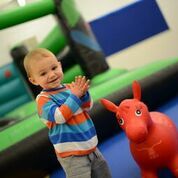 YMCA Chelmsford Childcare, Sticky Paws, was awarded Good by Ofsted in September 2018. Read more in the full Ofsted report. Welcomed into a safe, caring Christian environment with a happy and friendly atmosphere. Regarded as an individual, listened to, have their feelings respected and opinions valued. Cared for by skilled, experienced staff who understand the needs of children. Given praise and encouragement, opportunities to succeed, and an environment where positive behaviour is promoted. Encouraged to develop self discipline and consideration for others and the environment. Given access to stimulating, fun and creative activities supportive of each child’s stage of development which encourages emotional, social, physical, intellectual and spiritual growth. Provided with opportunities to realise their full potential to learn new skills, develop confidence and a positive self image.